Kirloskar Visiting Scholar Asim Waqif's piece Salvage comments on the consequences of urban development in Vancouver, Canada. “I find it very sad that design has been appropriated—by designers,” noted Kirloskar Visiting Scholar Asim Waqif at Strategies for Disruption, a campus-wide talk on October 15. During his weeklong residency at RISD, the artist—formally trained as an architect—shared how he rejected an overly professionalized, top-down model for doing design work and instead has built a career on making immediate, immersive art projects in service of sustainability and the public good. Throughout his talk Waqif presented highlights from more than 15 years of ambitious projects—from archaeological excavations to site-specific installations assembled from debris and post-consumer waste. Many of these also take on another life as “hidden activity spaces for marginalized people,” as Professor of Painting Dennis Congdon 75 PT put it—a testament to the Delhi-based artist’s commitment to genuinely populist design. During his visit on campus, Waqif also engaged with students through informal crits and a series of workshops at the RISD Museum. 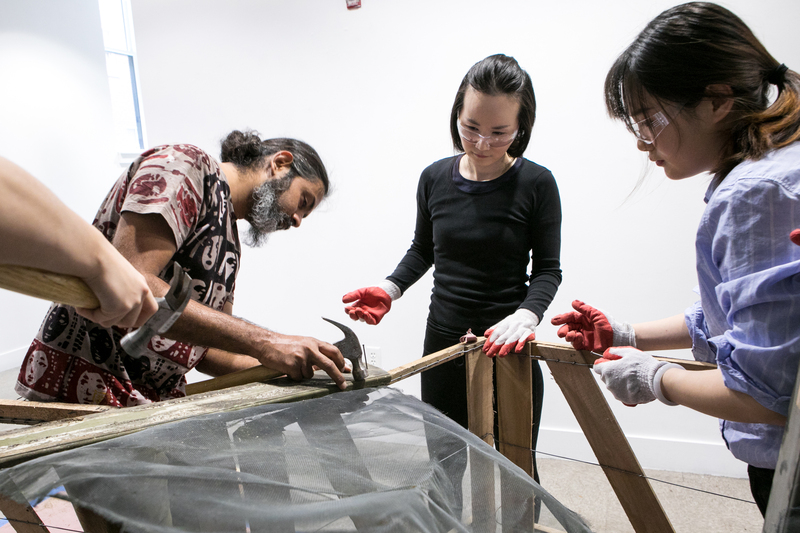 Made possible by a generous gift from RISD parents Vikram and Geetanjali Kirloskar, whose daughter graduated in 2012, the Kirloskar Visiting Scholar in Painting program supports an annual engagement with artists from the India/Pakistan region. 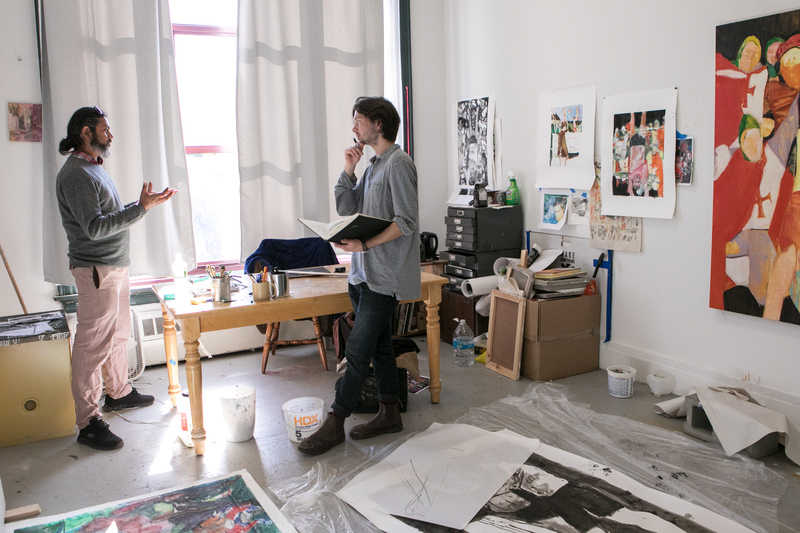 “Students and the broader community clearly benefit from our visitors’ fresh thinking and wider horizons,” Congdon says of the program. 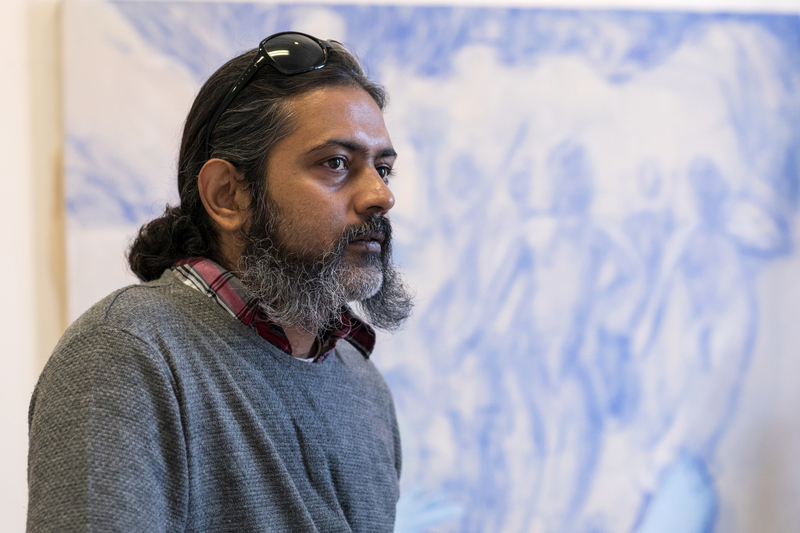 As part of his talk, Waqif spoke about the floating sculpture Help (2010), which he made to draw attention to massive pollution in northern India’s Yamuna River. This is made more urgent, he noted, by the disconnect between marine degradation in India and an enduring belief in the sacred, “soul-cleansing” power of rivers. Initially working without funding or permission for a public art project, Waqif soon earned a commission to create Andekhi Jumna (2011), an even larger sculpture on the Yamuna. 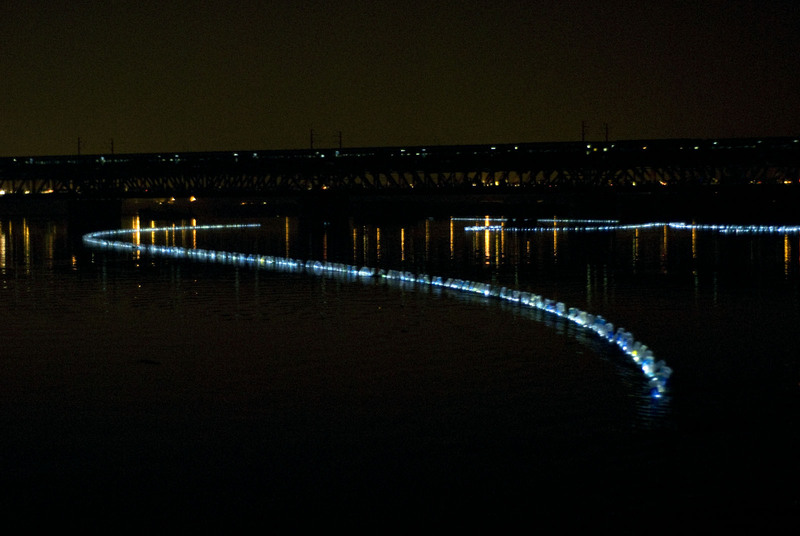 Using bottles, lights and boats, he “drew on the river” in order to evoke a sense of beauty threatened by dumping and other harmful activities. Waqif also spoke about his recent work Salvage (2017), a site-specific installation he made for the Vancouver Art Gallery to address the problem of displacement in rapidly developing cities like Vancouver. Noting that he wanted to restore a sense of desirability to things found on demolition sites, he was pleased that several viewers purchased or otherwise found uses for objects included in the exhibition. Following the lecture Waqif participated in a panel discussion with Dean of Liberal Arts Damian White, faculty members Namita Dharia and Lili Hermann, and N. Jonathan Unaka, an assistant professor of architecture at Wentworth Institute of Technology in Boston. In discussing the relationship of his work to activism, he openly questioned protest art that takes a directly confrontational stance, favoring instead a playful approach open to interpretation. As RISD’s 2016 Kirloskar Visiting Scholar, multidisciplinary artist Shahzia Sikander MFA 95 PT/PR is sharing insights about Islam, collaboration and multiculturalism through a series of public programs.